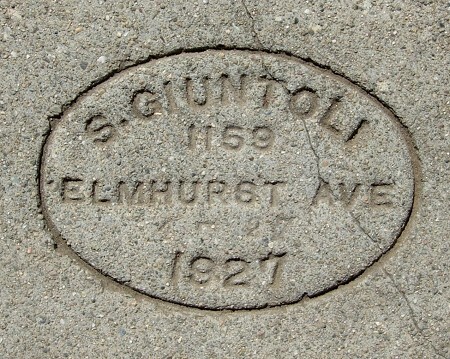 Silvio Giuntoli lived at 1159 Elmhurst Avenue and was responsible for the pavement on Elmhurst and the adjoining streets, largely in 1927. There are many excellent marks in this neighborhood, and the work has held up well for nearly 90 years. I chose this mark to feature because it includes the day and month as well as the year. The 1927 Alameda County phone book lists three Giuntolis, all in Oakland: Norma, a stenographer at the Oakland Fish Company; Pasquino, a plasterer; and Silvio. This entry was posted on 16 September 2015 at 12:03 am and is filed under 1927. You can follow any responses to this entry through the RSS 2.0 feed. You can skip to the end and leave a response. Pinging is currently not allowed.